Members of the Palm Beach Cardinals and Jupiter Hammerheads shaved their heads on June 17 to support the Vs. Cancer Foundation. Over $7,500 was raised for the event. The Palm Beach Cardinals, the Class-A Advanced affiliate of the St. Louis Cardinals, have had a terrific first half to the 2014 season. The team landed five All-Star selections to the Florida State League South roster, individuals have won weekly league awards and have been promoted within the organization, and overall, the team has been winning a lot of games. None of the individual honors or impressive team winning streaks come close to how the 2014 squad has impacted the community off the field. Earlier this month the Cardinals teamed up with the Vs. Cancer Foundation to raise money to help the fight against childhood cancer. 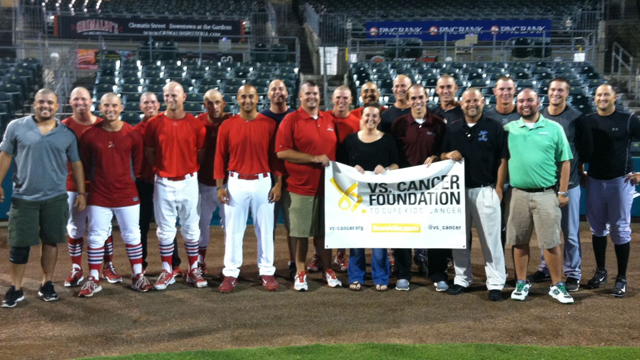 On Tuesday, June 17th, Roger Dean Stadium hosted the Vs. Cancer Foundation Fundraiser Night at the Ballpark. Members of the Palm Beach Cardinals lined up to get their heads shaved in front of the dugouts following the game that night against the Jupiter Hammerheads. Prior to the event, players on both the Cardinals and Hammerheads collected donations via fundraising pages to support the cause. Once the Cardinals learned that half of all proceeds from the fundraiser would benefit national childhood cancer research and the other half would help local children at Palm Beach Children's Hospital, the team joined together to make the event a huge success. The whole team took to social media right away, getting hundreds and hundreds of retweets from family, friends, and fans. Former college teammates and loyal supporters in the Cardinals organization took notice and helped spread the word. News about the team's efforts spread like wildfire and the donations started pouring in. The team goal of $5,000 was met after just three days of fundraising and was eventually shattered by more than one thousand dollars. Members of the team, led by Charlie Tilson and Joe Cuda, created an autographed ball giveaway for select fans who donated. The team spread the news via twitter that five autographed balls would be given away at random to those who donated to the cause. "I'm just glad I could be a part of this," Cuda said. "I never would have thought that it would have created this much buzz. It's crazy how the baseball community is so connected together." On June 17th, the Cardinals gathered in front of the home dugout following the game to cap an extremely successful fundraising campaign by shaving select team members heads. Players who participated in the head shaving event were, Cuda, Tilson, Iden Nazario, Bruce Caldwell, Alex Mejia, Jesus Montero, Nick Martini and Jimmy Bosco. Even head trainer Keith Joynt stepped into the dugout barber shop to support the cause. For the Cardinals, this wasn't a one-time ordeal. Players have been giving back to the community all season long. In early May, members of the team signed up to visit Palm Beach Children's Hospital to spend time with children for a few hours before a home game. While just a few guys were asked to ride along for the visit, multiple players asked if they could go as well for fun. While the fact that the Palm Beach Cardinals ranked in the top five in numerous batting and pitching categories among Florida State League teams in the first half of the season is impressive, the character of the guys in the Cardinals clubhouse is something to be commended. The 25 players in the Cardinals locker room are truly making a difference in the Palm Beach community.